Burgun & Schverer internally decorated floral vases are the cat's meow. 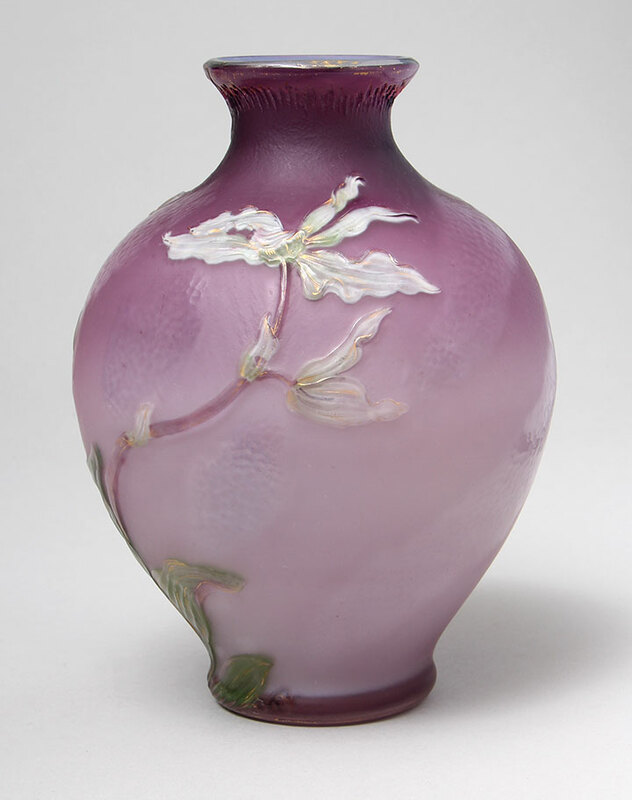 This example is special, with white orchids on a pink-violet background. The colors and detail are incredible, with flourishes of martelé wheel-carved in the background. Really nice size at 9½" and bulbous. Beautiful full signature on the underside. Mint condition. 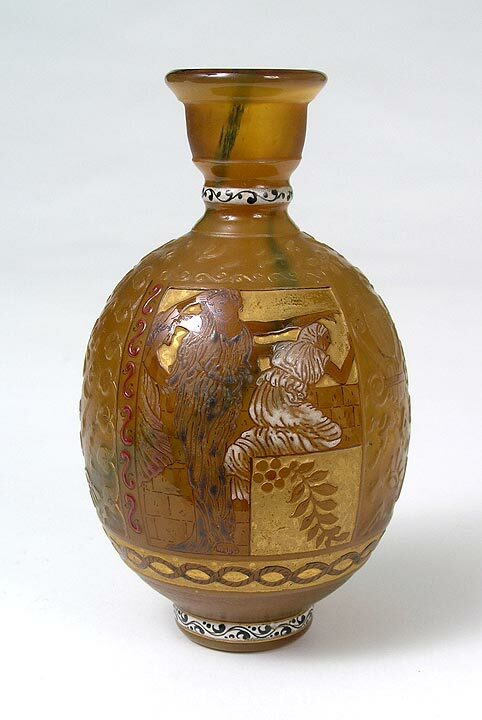 Nobody made better French cameo glass than Burgun & Schverer. 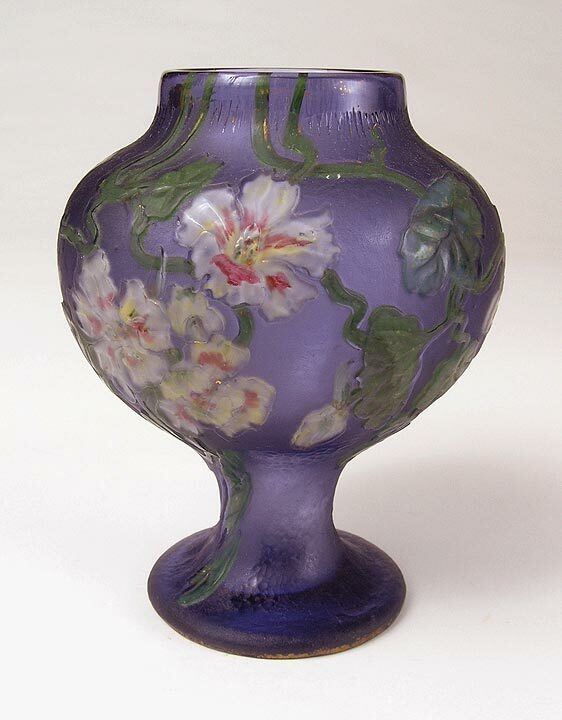 Their internally decorated vases were so sophisticated, with so many different techniques, that they must have taken weeks to make one vase. 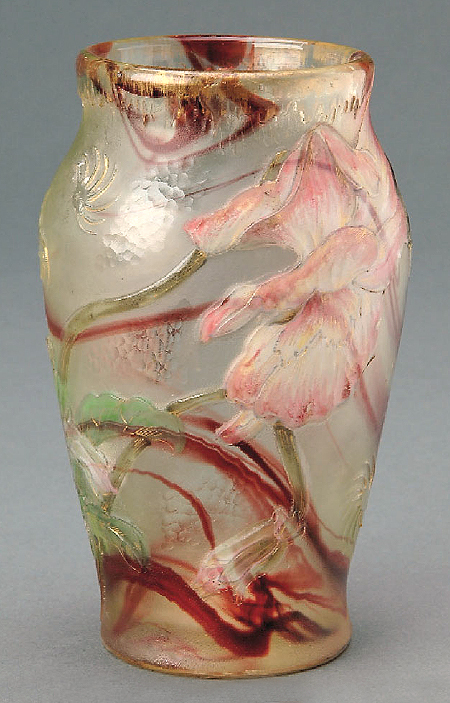 This example has truly gorgeous color, with the bleeding heart flowers between the layers of glass. It's the best! I rarely get B&S vases of any quality, let alone this quality. 6½" tall. Signed. Mint condition. 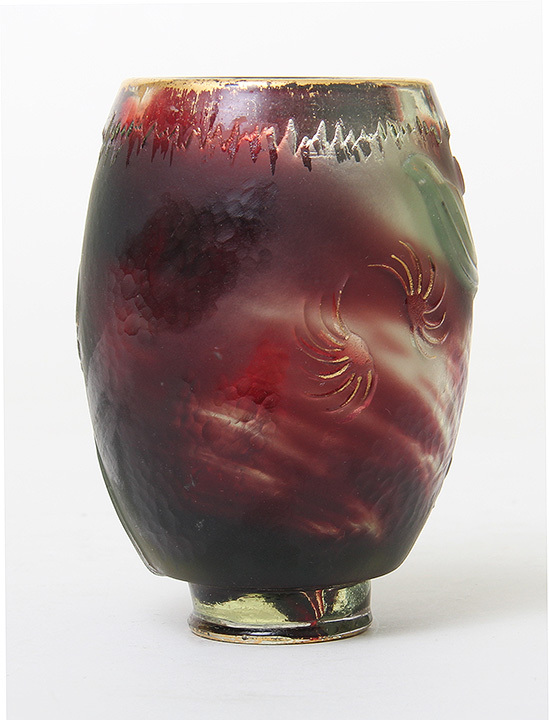 The quality and sophistication of Burgun & Schverer vases is a level beyond most other companies. They just made great items. This example utilized many techniques, including acid-etching, internal decoration (of which they're famous), hand-painted enameling and gilding. It's a fantastic example of their classical subject matter. What's especially nice is the gilding -- there is almost no wear. The size is great at 8¼". Signed. Mint condition. 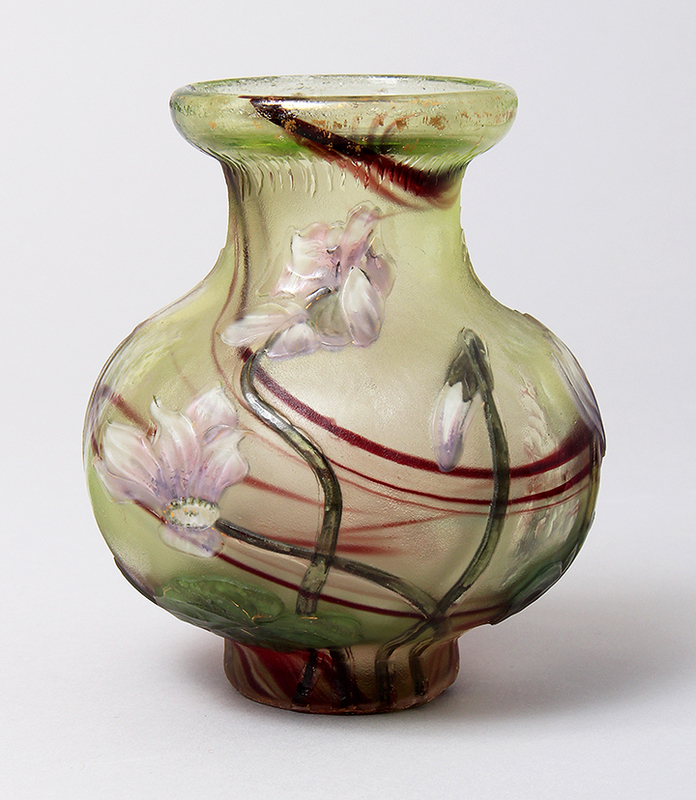 Another top quality vase by one of France's finest makers - Burgun & Schverer. The subject matter is great with classical figures. 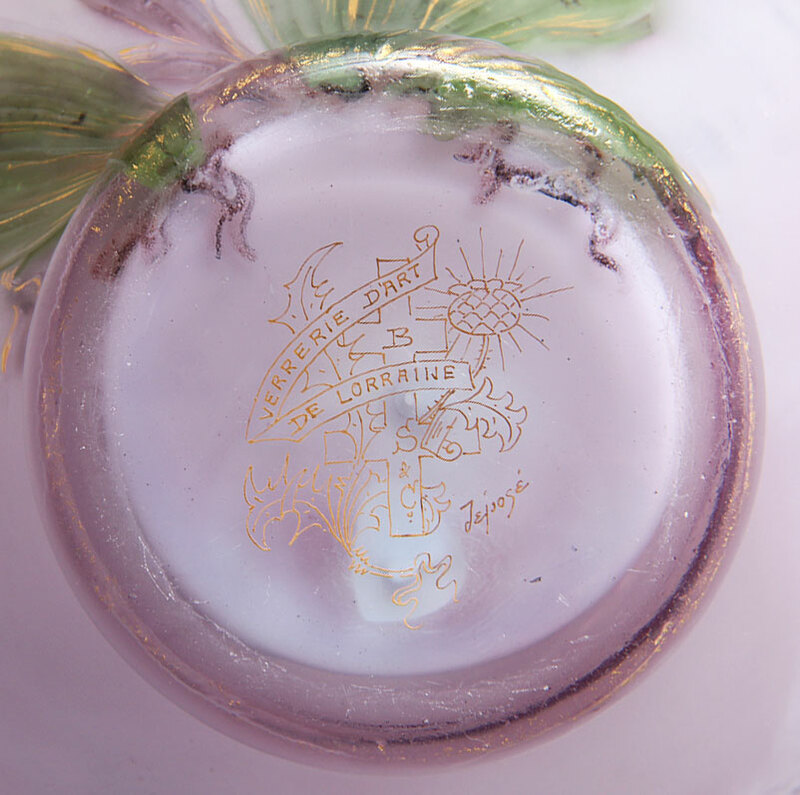 The techniques are multiple with acid-etching, enameling, gilding and internal swirls. 6½". Signed. Mint condition. 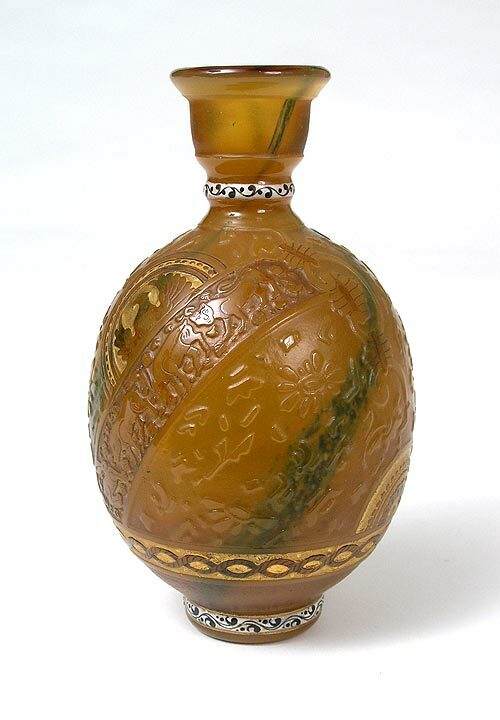 Burgun & Schverer internally decorated vases are all rare and desirable. Occasionally one rises to the top. This example is one of those. It has fabulous color and the usual great detail that comes from wheel-carving. Much of the original gilding remains. It's a mini at 4" tall, and a beauty. Signed. Mint condition. 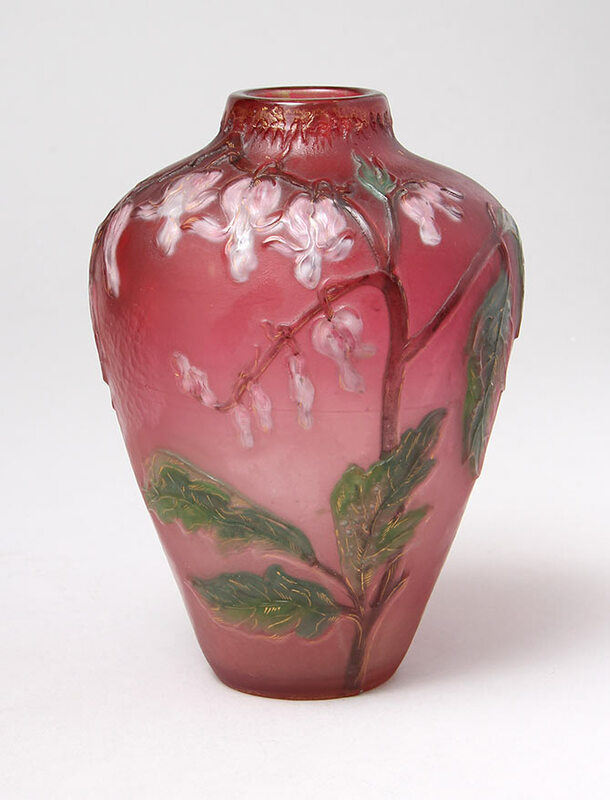 Burgun & Schverer (B&S) internally decorated vases are the most complex and sophisticated of French cameo glass. They're the cat's meow. This example, with beautiful pink and white cyclamen flowers, is fantastic. 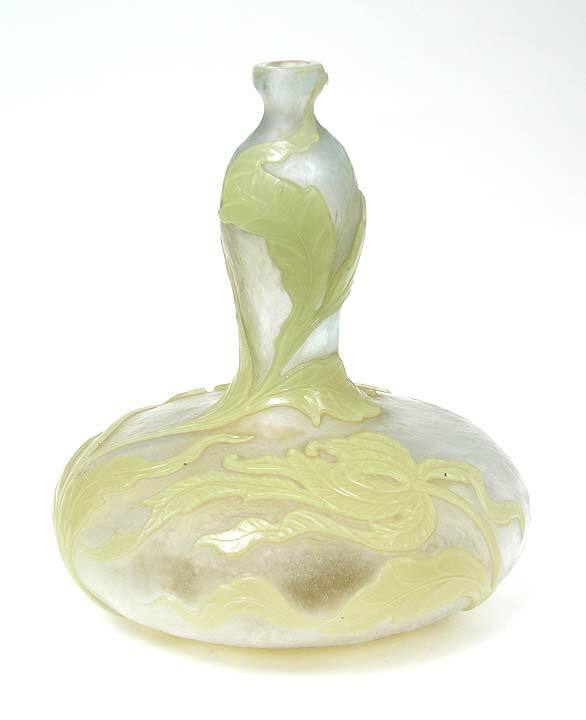 It's petite, at 4" tall, but of the finest quality, for the best collections. Beautiful gilded signature on the underside. Mint condition. 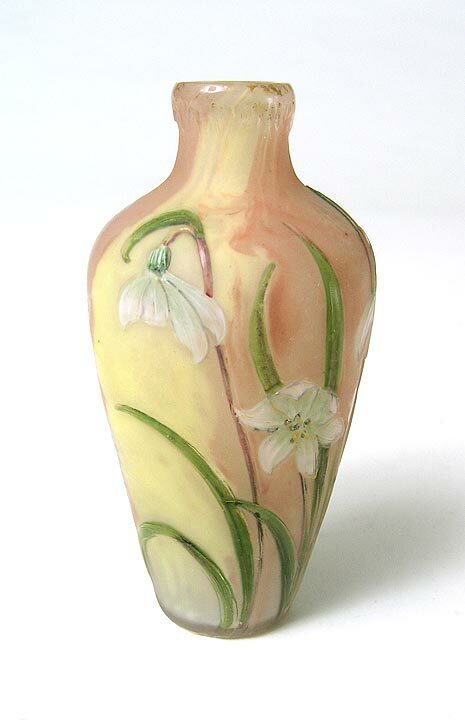 It doesn't get better than B&S internally decorated vases for quality and beauty. 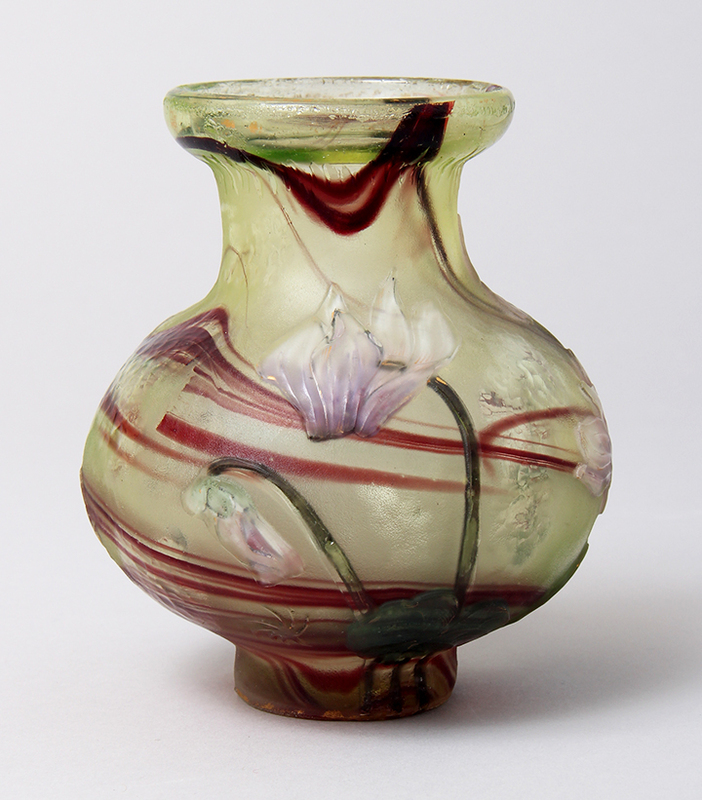 The workmanship involved in creating a vase this sophisticated took weeks, not days. 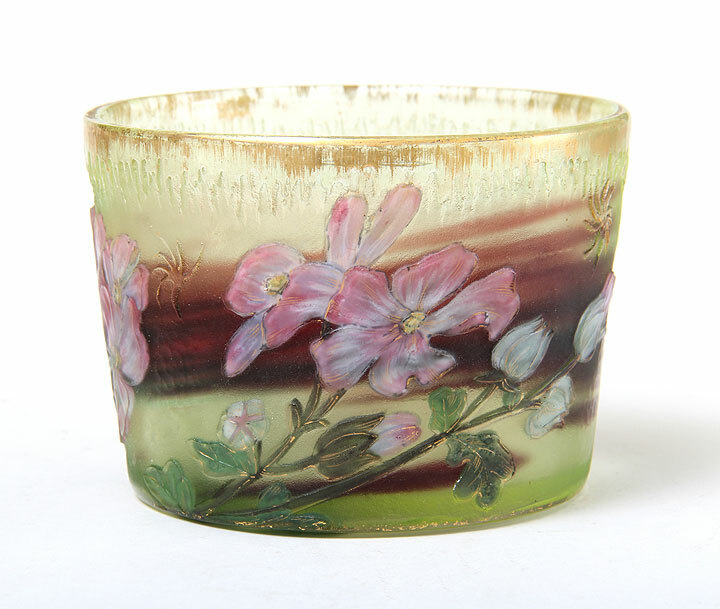 The results are fantastic, with gorgeous purple and white cyclamen flowers and burgundy swirls inside the glass layers. On the outside, the detail has been wheel-carved and gilded. The bulbous shape allows for a larger surface area for more flowers. It's gorgeous! 5¼" tall. Signed. Mint condition. 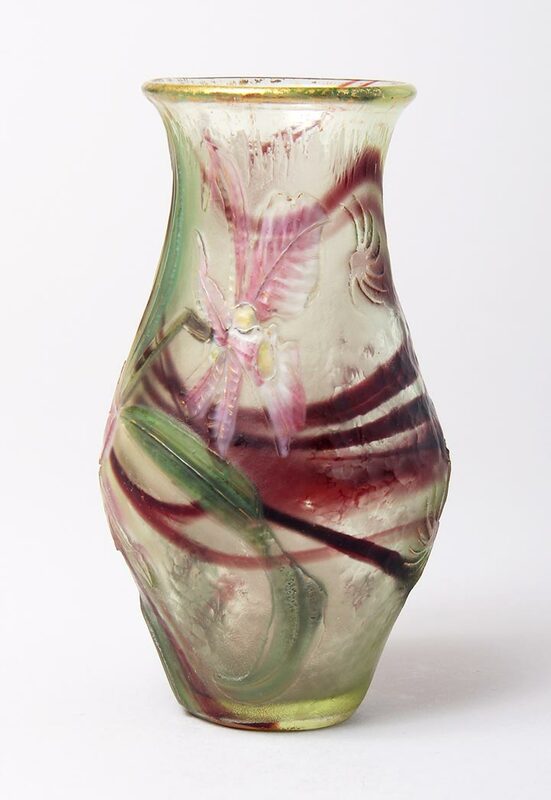 Burgun & Schverer (B&S) internally decorated vases are the most beautiful and technically sophisticated vases of all of French glass. 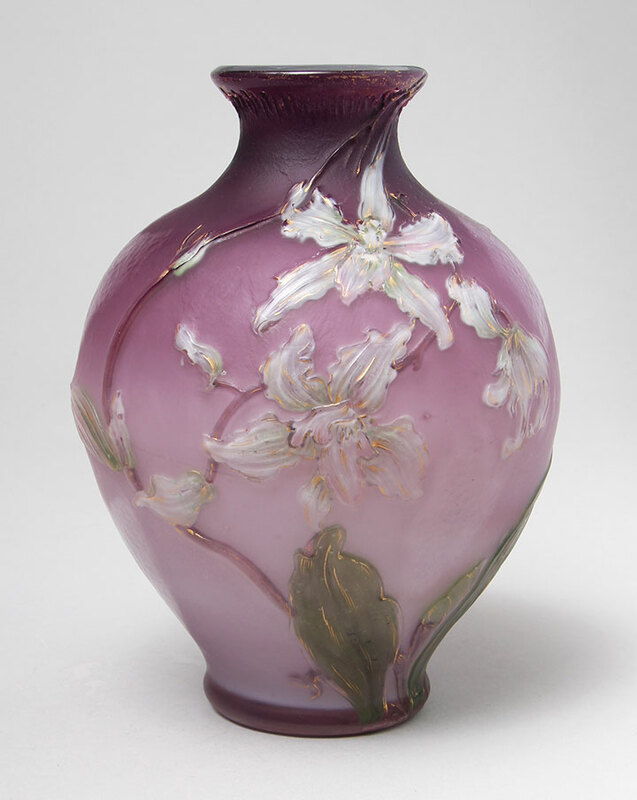 This example has pretty, different-colored flowers and leaves that are internal. 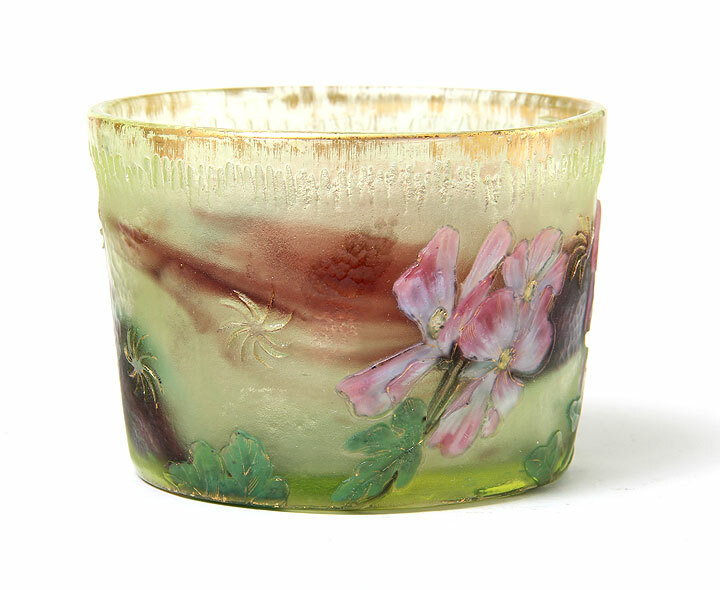 The outer layer is all wheel-carved, with gilded detail that has been hand-painted and fired. 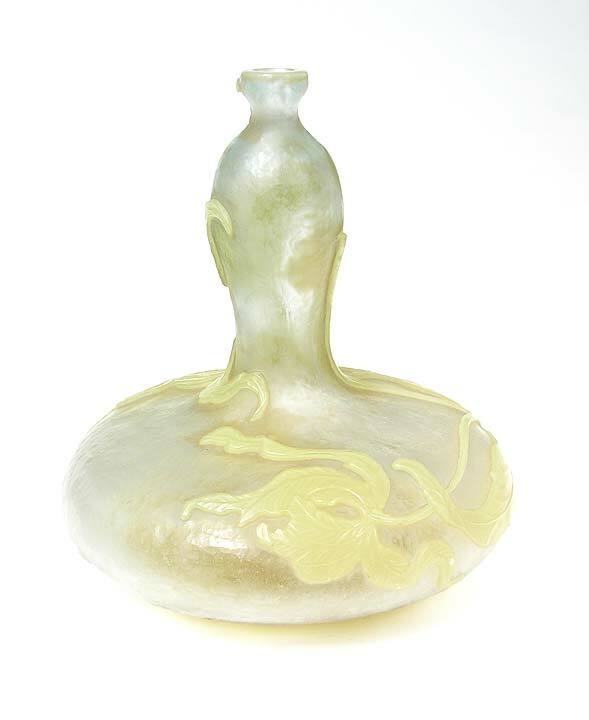 Hold any B&S internally decorated vase in your hand and you'll see why these vases are so special. 3" tall x 3½" diameter. Signed. Mint condition. 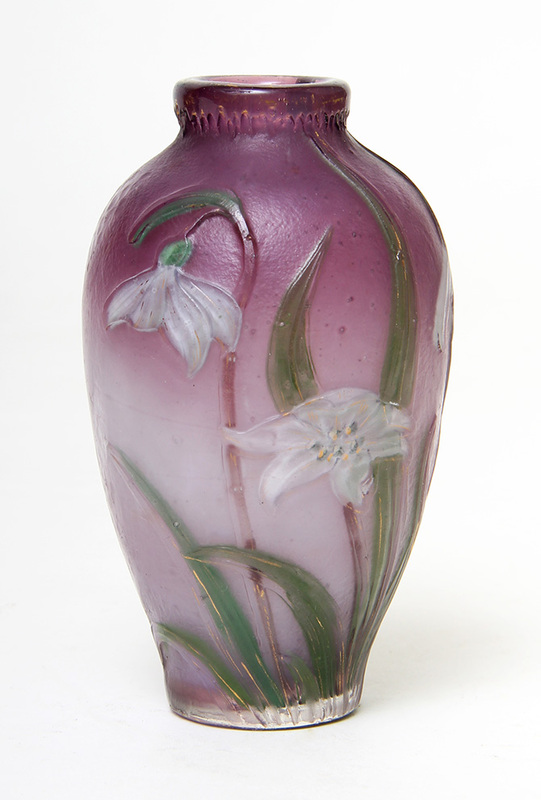 B&S internally decorated vases are the epitome of quality. 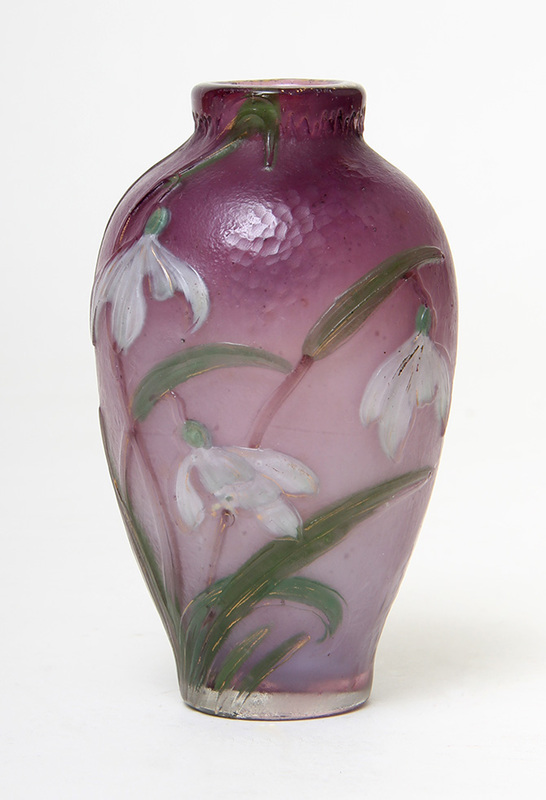 The workmanship involved in creating a vase with this many techniques must have taken three times longer than for a standard French cameo vase. 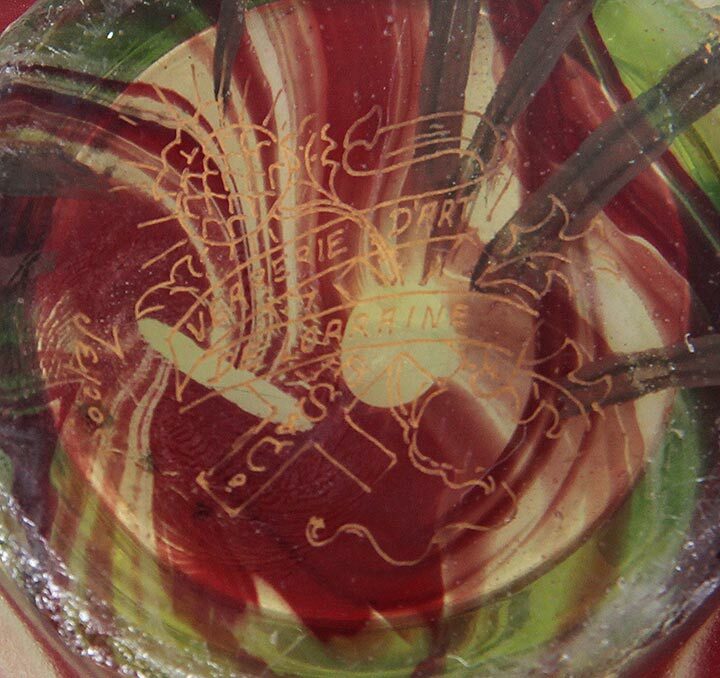 The results are fantastic, with gorgeous white flowers and burgundy swirls inside the glass layers. On the outside, the detail has been wheel-carved and gilded. What a vase! Diminutive in size at 6¼", but superlative in beauty and quality. Signed. Mint condition. 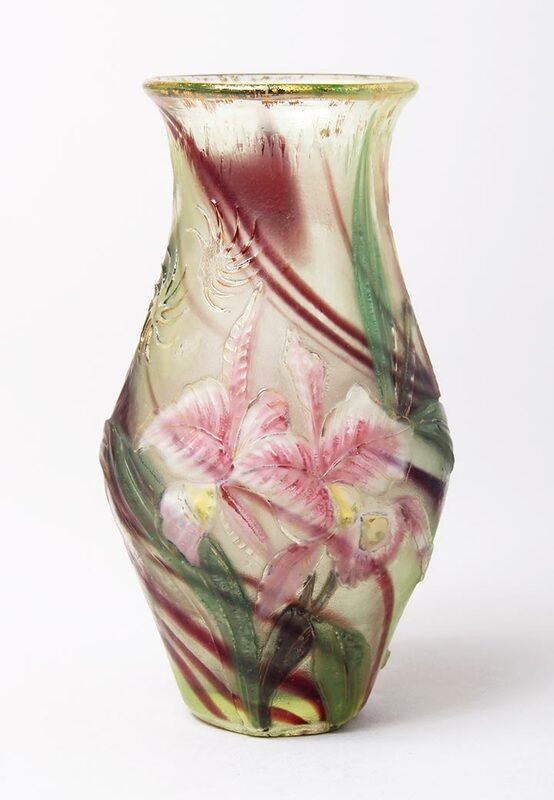 This beautiful B&S mini vase has internally decorated and wheel-carved flowers with gilded highlights, gilded rim and martelé flourishes in the background. The purple background is lovely. 4½" tall. Signed. Excellent condition. 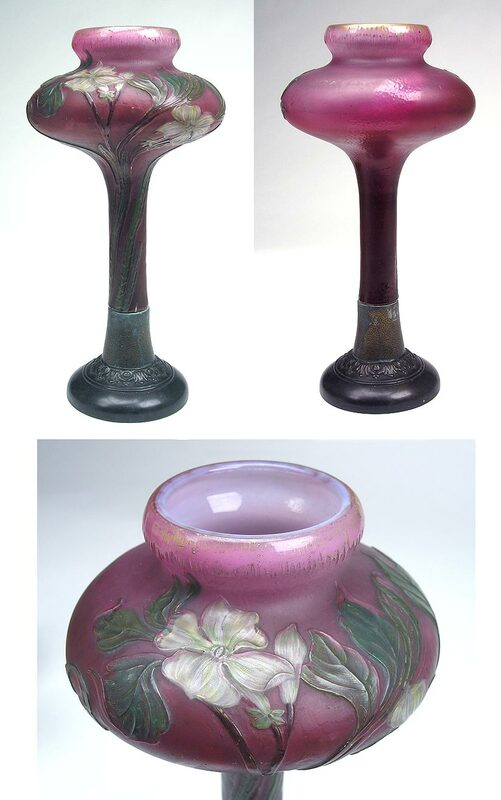 The quality and workmanship on B&S vases is almost always superb, but there are still big differences amongst vases. This example has it all. The gorgeous flowers are magnificently colored and internal. The outer layer is all wheel-carved, which gives great depth to the flowers. The colored swirls are all internal. 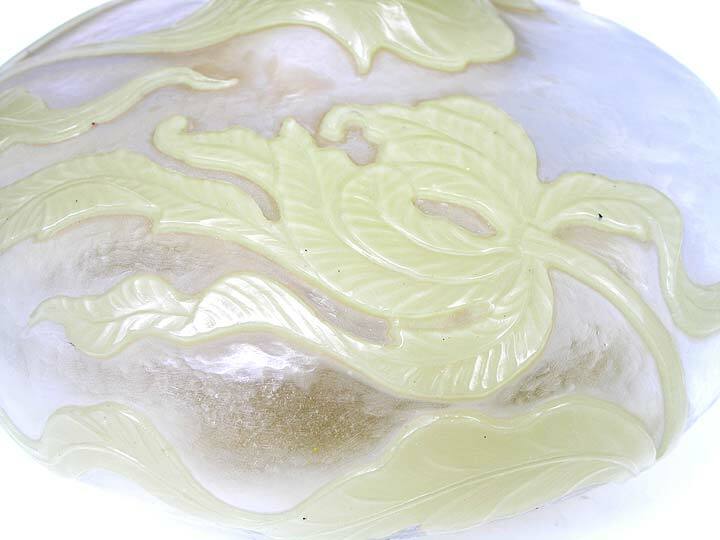 Much of the detail is hand-painted gold, which has been fired. This is one of the best B&S vases that I've had the privilege of owning. 6" tall. Signed. Mint condition. I always feel lucky when I get an internally decorated B&S vase. They're very hard to come by, especially if the color is good and the flowers are pretty. I just bought this vase and I suspect it won't last long. 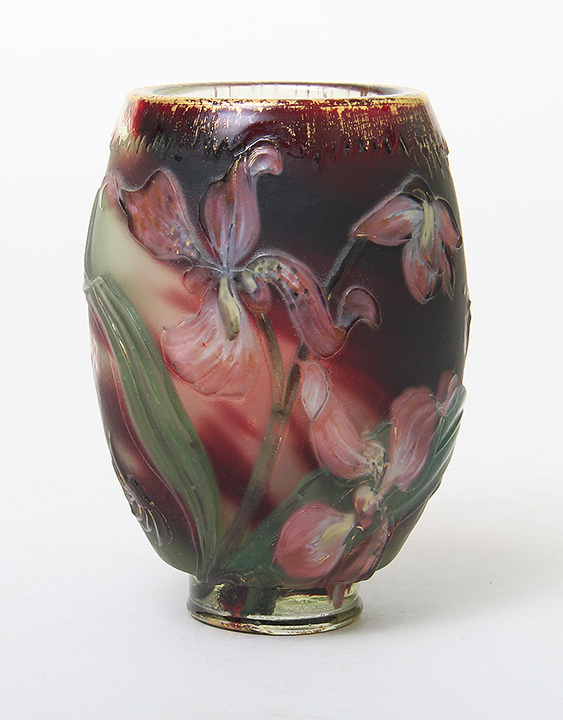 It's got gorgeous iris flowers in glorious colors, with the usual amazing workmanship that goes with all B&S internally decorated vases. 7½" tall. Mint condition. Signed. 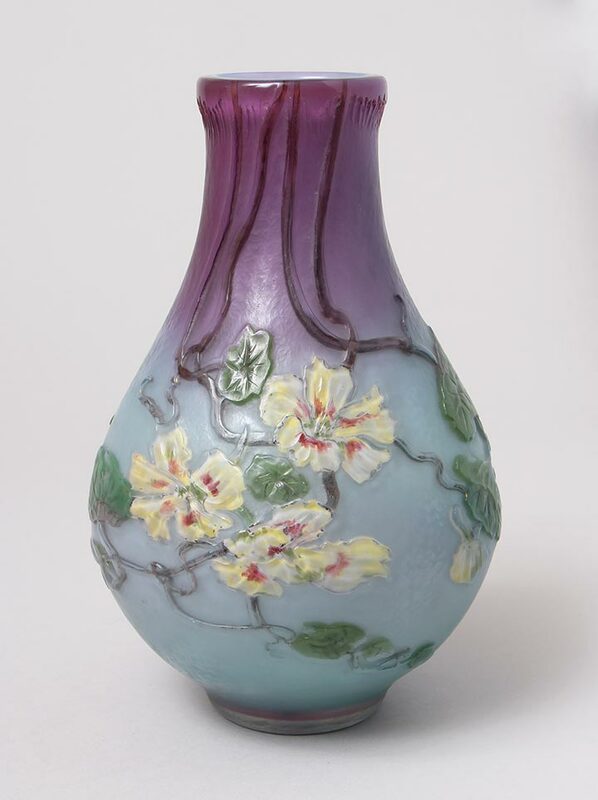 Burgun and Schverer internally decorated vases are of the highest quality. They employ many techniques including internal decoration, hand-painted enameling, wheel-carving and gilding. The result is spectacular. 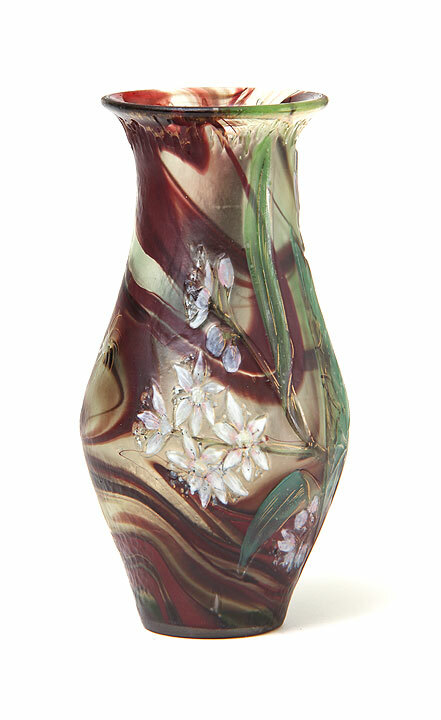 Truly outstanding workmanship creates gorgeous, realistic flowers and a wonderful vase. 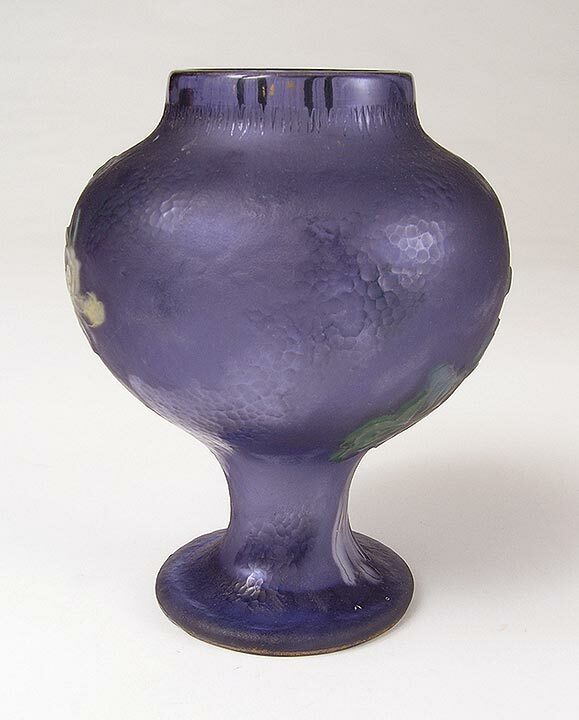 3½" tall x 4¾" diameter. Signed. Mint condition. 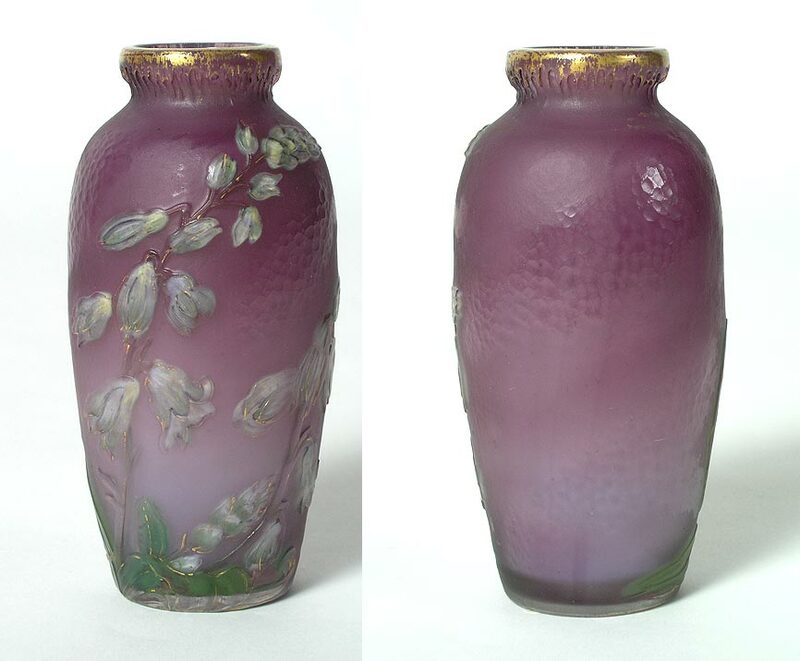 The quality and workmanship on B&S vases is usually superb, but there are still differences in quality. Cream rises to the top. Orchids are gorgeous flowers and rare subject matter for B&S. The internally decorated flowers contrast beautifully with the gorgeous shaded lavender background. 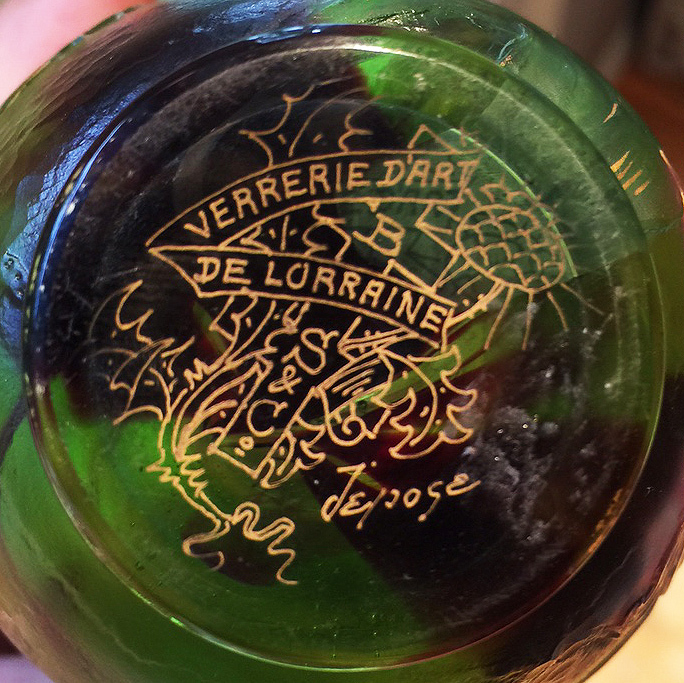 The outer layer is all wheel-carved, including flourishes of martelé carving. 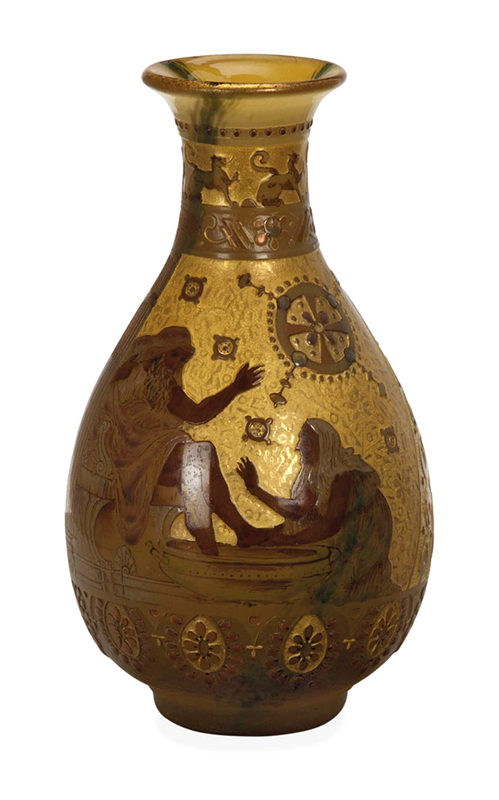 The detail is hand-painted gold, which has been fired. 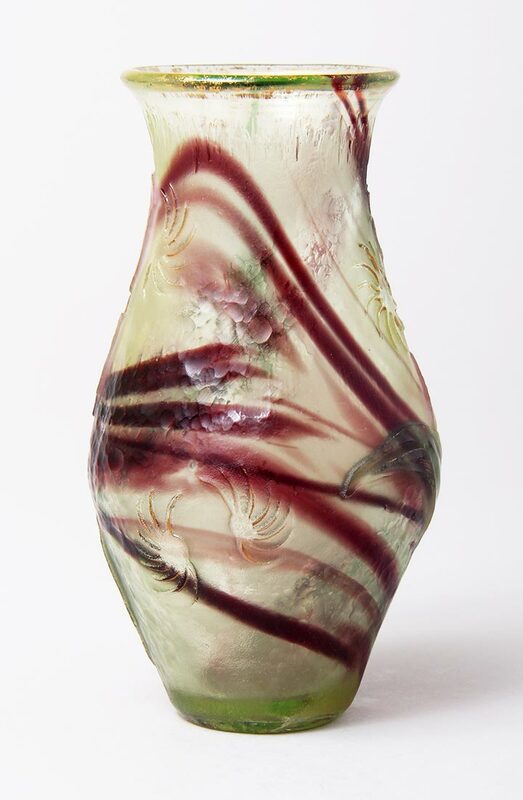 This is a really great B&S vase that is quite large at 8½" tall and bulbous. Signed. Mint condition. For the best collections. 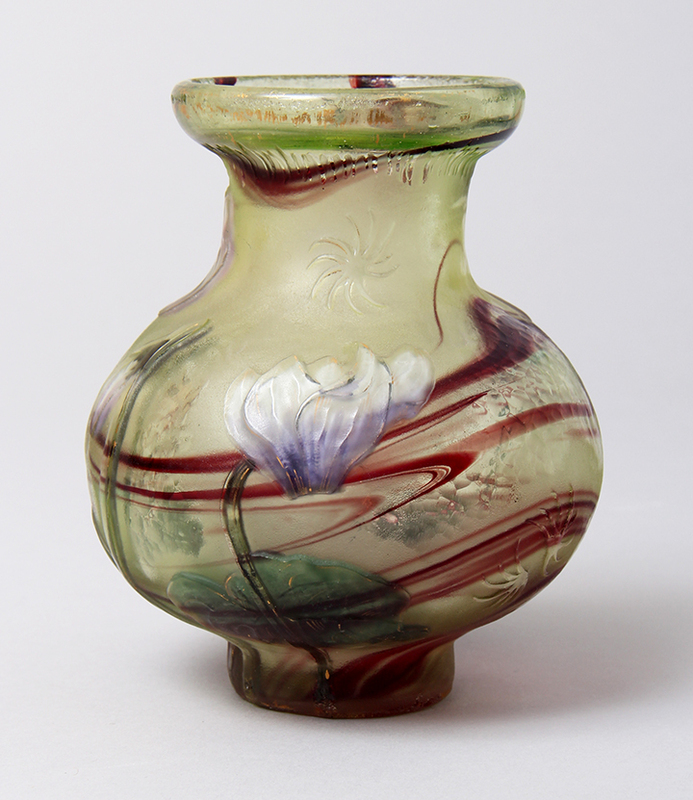 French glass doesn't get any finer than Burgun & Schverer internally decorated floral vases. 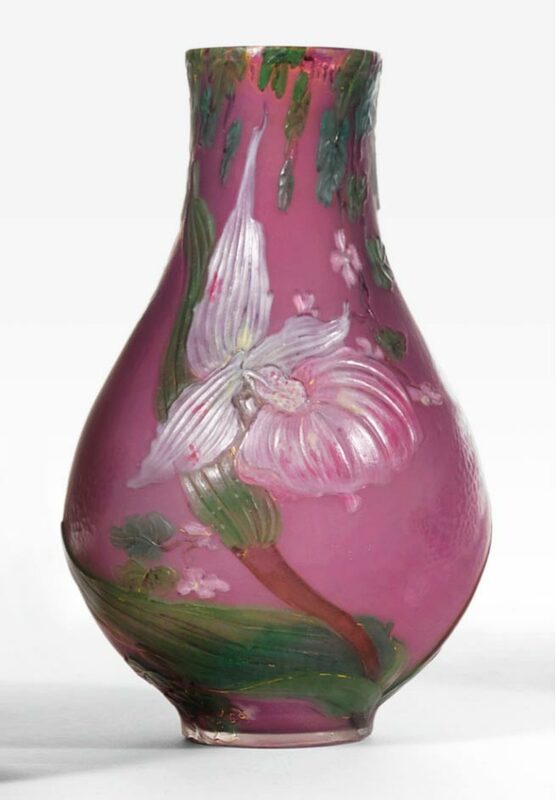 This special example has gorgeous white and pink orchids, with internal swirls of burgundy and flourishes of martelé wheel-carving on the surface. Medium size at 6" and slightly bulbous shape. Beautiful full signature on the underside. Mint condition. B&S at its best. 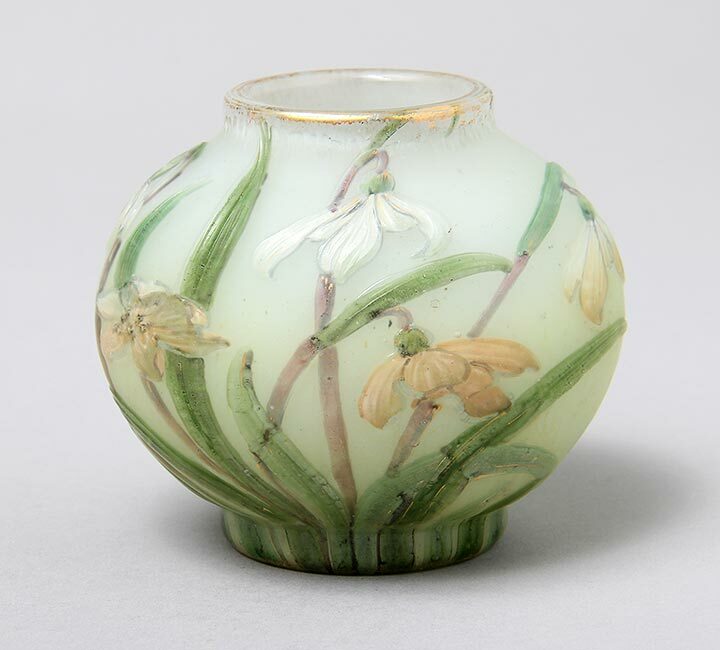 This is a beautiful mini vase with internally decorated and wheel-carved flowers with gilded highlights, gilded rim and martelé patches in the background. The purple background is the best. 5". Signed. Excellent condition. This is an example of the best work by B&S in an unusually big example, 13" tall. 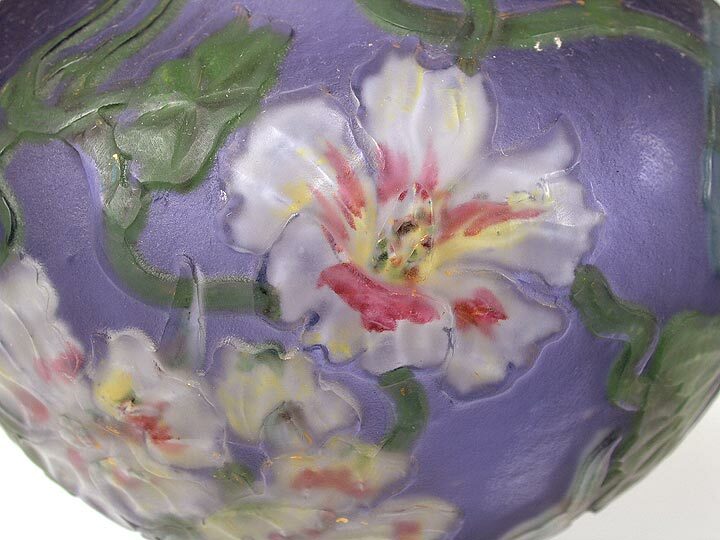 The flowers are internally decorated as in a paperweight vase. The flowers, leaves and stems are then wheel-carved, followed by gilded details in the leaves and stems and a gilded rim. This is a fantastic vase. The bronze foot is possibly original. Apparently unsigned. Mint condition. 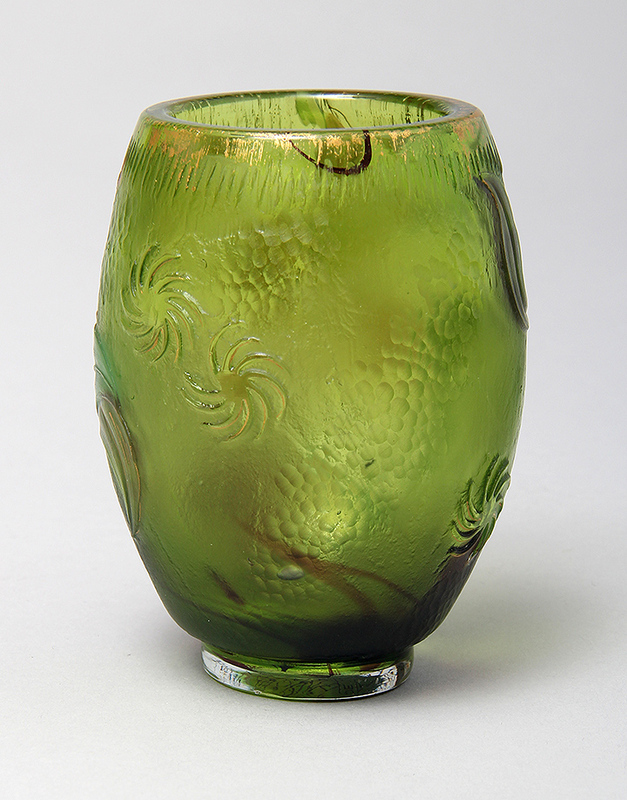 Burgun & Schverer made some of the highest quality French glass that is available on the market. This is one of the most beautiful examples I have ever owned. The color and the quality are amazing. 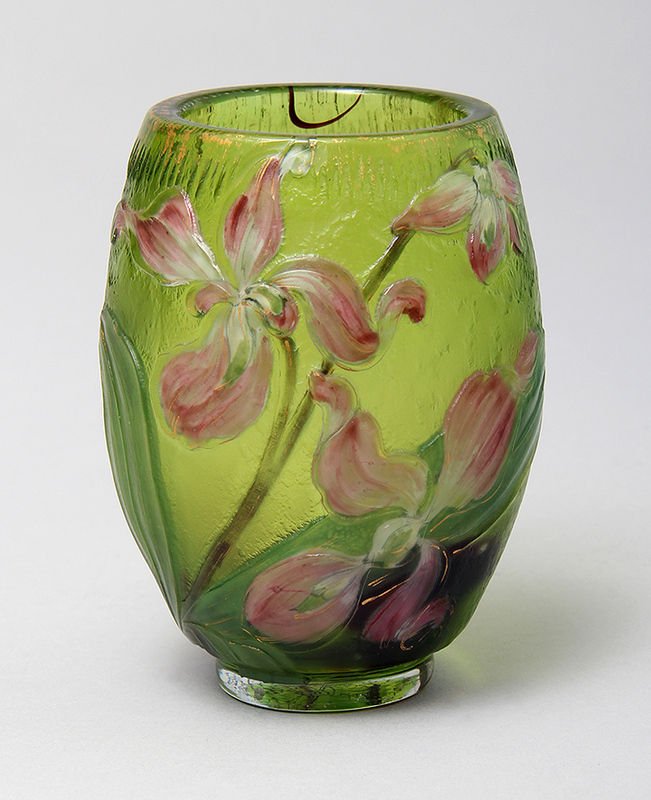 The flowers are internal with hand-painted detail. 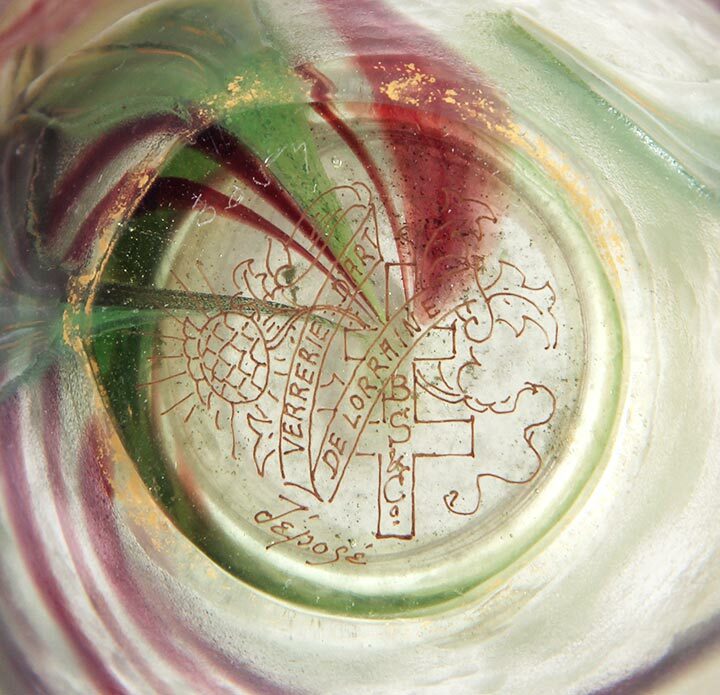 The overlay of clear glass is wheel-carved with super detail and martelé flourishes in the background. There is additional gilded detail. All in all, it doesn't get much better than this. Wonderful bulbous shape and nicely sized at 7". Signed. Mint condition. 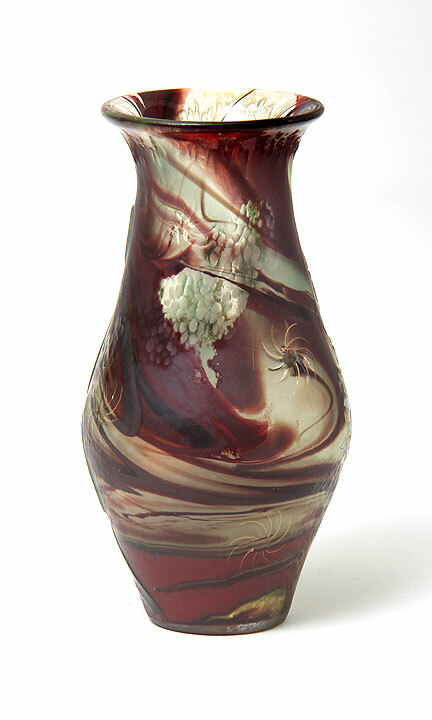 Another example of the superb and complicated workmanship necessary to make this vase. It's a mini for B&S at 4¾". It has all of the details of larger vases - internal decoration, wheel-carving, martelé flourishes in the background, gilded details, etc. It's a little beauty. All of the colors work so well together. Signed. Mint condition. The carvers at B&S were masterful. This example has exceptionally deep carving with the most outstanding detail. 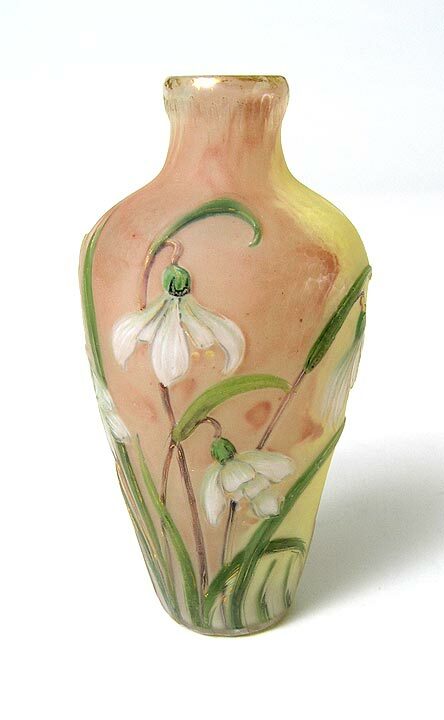 It a stunning vase, priced to sell. Very nice size at 7¼" tall x 6¾" diameter. Signed. Mint condition.